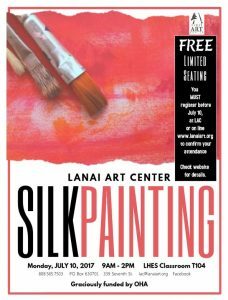 Michelle Fujie is offering a special 1 Day Class on the basics of Silk Painting. Take home your own one of a kind silk art accessory! This is a FREE event graciously funded by OHA but you MUST register before July 10 in order to attend. All materials and instruction are provided. Sign up now for this popular class!